I’ve been doing a lot of talks lately in which I encourage people to share with the wider community what they do (see my Employee Evangelism post). Be it through blog posts or talks or workshops, I believe everyone should be finding a way to teach others the things that they’ve learnt or they’ve done. One of the most common things that I hear from people though is that they’d love to do more of this, but that they don’t have anything worth talking about. And that’s absolutely not true. Everyone has something that’s worth sharing with others. Every person knows something that others don’t. It’s very easy to undervalue the things that we know, and that we assume are common knowledge. 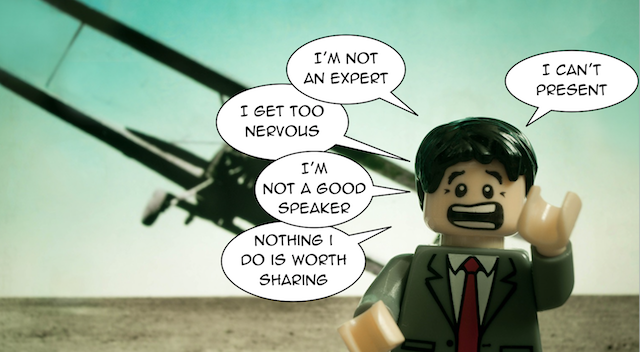 You might not be the “number one expert” in something, but honestly you don’t have to be to be the one talking about it. In some areas actually being a non-expert might give you a different and perhaps a more relatable perspective, allowing other non-experts to easier understand the topic. But how do you discover what you should be talking about? I thought I’d share some tips and tricks of how I approach coming up with my talk (and blog post) ideas and turn it into an exercise of sorts that anyone can start with. Location: where are you doing this talk? Is it at a specific conference or meetup? Is it internally at work? Who is your audience? What is their background? What do they know already? Format: how long is the talk? Is it a lightning talk or a longer talk? Are you live coding or demoing something? Topic: what is the talk about? What message do you want people to take away from it? Each of these elements need to be in equilibrium with other, making sure that all three matchup. For instance, a lightning talk about dinosaurs might not be appropriate for a specific technical conference, or an in-depth talk about encoding might not work as a lightning talk. When it comes to brainstorming talk ideas, I find that using the above structure allows you to approach the problem of finding a topic in two different ways: start on either the Location side or the Topic side and make your way across. Neither direction is right or wrong, but it allows you to focus your brainstorming. If you have a specific location in mind, it can help you come up with what type of topic is appropriate for it. Likewise if you don’t have a location in mind, you can be more unconstrained in coming up with ideas, and figure out later where you’ll do the talk. 1. There are no stupid ideas. Write down every single idea that you can think of, no matter how stupid or boring or uninteresting you think it is for other people. As I said above, we often forget the things that we know and we’ll disregard ideas that we think no one else will care about. When I did this exercise with people at work, people were often surprised that others wanted to hear about some of the “silly” ideas they came up with. 2. Keep track of your ideas. Use this as the time to start a list of all the ideas you have. Even if some of them don’t feel quite right right now, add them to a list or a doc: somewhere that you can keep track of them. This isn’t about creating a huge list, picking one and throwing the rest away. It’s about creating a repository of all the ideas you have that you one day might want to talk about and revisit. I’ve done talks based on talk ideas that I initially came up with 2 years ago – some talks need time to simmer and evolve. 3. Develop the “that-would-make-a-good-talk” voice in your mind. Most of the exercise questions below are about developing what I call the “that would make a good talk” voice in your head. Rather than having these specific brainstorming sessions, I tend to always have these type of questions in the back of my mind whenever I’m working on a project or having conversations with people. My natural instinct now is to always consider whether there’s a story hidden within anything that I’m doing (and pointing it out for others when I see they’re doing something). I’m hoping that some of these things will become more natural for you by doing these exercises. 4. Don’t get stuck on the title. The following exercises are about coming up with ideas for your talks, not the title. I’ve noticed people trying to come up with variations of what to call their talk, which at this point doesn’t really matter yet. You can figure out later what title works and is catchy. Right now it’s about the content – focus on that! If you know you struggle with coming up with ideas, try to get a group of friends or colleagues together and help each other with these exercises. Discussing and explaining some of these questions with others and having other people to bounce ideas off can help a lot: you might discover ideas that you wouldn’t have alone. Write down all the topics you’re interested in and you know about. It doesn’t matter how obscure – add it to the list! Think back to what you’ve done the past month. What problems did you come across that were challenging to deal with? What things did you work on that you’re proud of? What did you spend a lot of time on that maybe could have gone quicker if you knew something you do now? Can you remember any long emails, slack messages, git commits, pull requests, internal docs or long conversations recently, where you’ve explained something to someone? Would someone else benefit from learning that? What’s one thing you wish everyone knew or was taught? Why? Think about recent conversations and discussions with friends or colleagues. What topic could you easily talk hours and hours with them about? What excites you? What infuriates you? What’s something that you wish you could know more about? Are there any questions you have that you wish you knew the answer to? Coming up with a talk will give you a push to dive into that topic. Think about your favourite books, music, movies, museums, restaurants, sports teams, famous (or nonfamous) people, cars, anecdotes, countries, food, animals, games. Take a look at talks or speakers that inspire you. What do they have in common? What would your take on it be? Think back when you started your career – are there any topics that you think could have helped you if you had heard about it earlier? What processes/work/things do you do that make your life easier? If other people did it too, would it make their lives easier? Write down what types of talks you’re interested in. Examples: lightning talk, internal work presentation, small meetup, conference talk. Do you want to do demos? Or live coding? Or making the talk interactive in some way? Think about the type of talk that you would enjoy participating in. Think about the type of talk that you would enjoy giving. Write down specific conferences or meetups that you’d like to talk at. Does the event have a theme? What type of audience attends? What’s their background? Look at the event’s past talks or their call for papers. Are there specific topics or problems that they are interested in? Look at the event’s past speakers and their talks – do you agree or disagree with any their opinions? What area would you like to see more of? What questions do you have that you‘d like answered? If you were at that event, what talk would you want to see? What talk would be on your must-watch-don’t-miss list? Hopefully the above exercises will have given you some inspiration and you will have ended up with a nice list of talk ideas that you’re interested in. The exercise questions obviously aren’t exhaustive and I’m curious to hear what other questions get your mind thinking about potential ideas. I’d also love to hear if these exercises help you, so feel free to email, comment or tweet me about this! Once you have this ideas list, the next steps are deciding which idea to develop further, figuring out what events are out there and how to create talk proposals for them. In the upcoming weeks I’ll be writing blog posts for each of these topics, so stay tuned!